As some of you know I'm a strap freak and I have shared dialog with IWB about some of the high rollers like Camille Fournet, ABP and Jean Rousseau. If cost is no object then ABP is king of the strap universe. Also, being French they will use many skins that are questionable to export and ship without proper paperwork. My feeling on gator and it's just a gut one is that Camille Fournet uses slightly larger skins than Jean Rousseau so you get bigger, more dramatic squares. Prices are about equal, I find Jean Rousseau will go the extra distance to replicate a strap or provide tubes or such not for Panerais. However when it comes to custom calf straps CF prices out well over $200 for a pair of straps. They offer significantly less color and thread options. 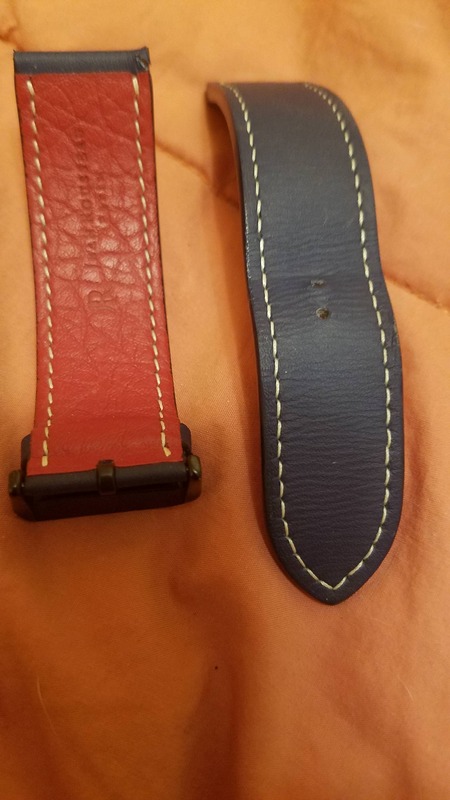 I bought this beautiful blue calf strap with hand stitching, custom thread choice, black waxed edges and hand stitching for $140 from JR. It also has shark-skin lining which helps repel perspiration. Camille Fournet will do the same strap with less colorways for $225. So my nomination for permanent Black Friday is a custom calf strap from Jean Rousseau.